Craniospinal rachischisis is a rare and severe form of neural tube defects (NTDs), which is always fatal. It is characterized by anencephaly accompanied by a bony defect of the spine and exposure of neural tissue. We describe the two patients with ultrasonographic and magnetic resonance imaging appearance of craniospinal rachischisis totalis, detected antenatally at 22 and 25 weeks of gestation, and confirmed after termination of pregnancy. The multifactorial etiology of NTDs, with specific reference to folate deficiency, is discussed with possible role of folate fortification in the Indian context. Neural tube defects (NTDs) are common congenital malformations (second most common major congenital malformations after cardiac anomalies and the most common malformation of the central nervous system). Craniorachischisis is a rare and severe form of NTD that results when the neural tube fails to close normally in the primary neurulation/dorsal induction stage of the central nervous system development, during the 3rd–4th week of gestation, leading to fetal loss and stillbirth.,, The failure of closure of cranial pore and parts of neural tube produces the two severe forms of NTDs, namely, the anencephaly and spinal rachischisis totalis. Ultrasound has established itself as a sensitive and accepted modality of choice for the prenatal detection of all congenital anomalies, including the NTDs. Recent studies have shown the complementary role of fetal magnetic resonance imaging (MRI) for the confirmation of such anomalies.,, NTDs are one of the few congenital defects amenable to preventive measures. Maternal folic acid supplementation significantly reduces the number of NTDs including lethal defects such as acrania, exencephaly, anencephaly, and rachischisis, with various studies showing 35%–75% reduction in NTDs by maternal folic acid ingestion. 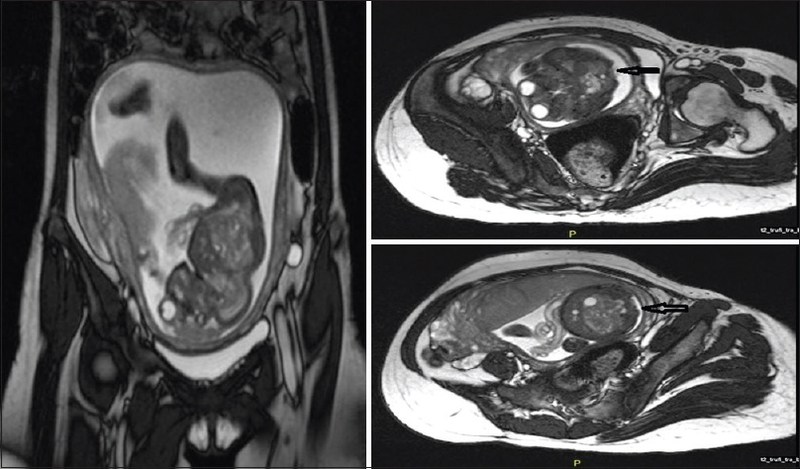 We present two cases of 22 and 25 weeks of gestation who came for routine obstetric scan and subsequently underwent fetal MRI for anencephaly and craniorachischisis that was confirmed after termination. A 21-year-old primigravida presented at 25 weeks of gestation for her routine evaluation. There was a history of third-degree consanguineous marriage. This pregnancy was a spontaneous conception, confirmed by urine pregnancy test at 2 months of amenorrhea. There was no known teratogenic exposure during pregnancy. She had previous two antenatal visits and started taking oral iron-folic acid tablets only from the 4th month of pregnancy. There was no history of epilepsy, diabetes mellitus, thyroid disorders, hypertension, psychiatric disorders, or chronic intake of medications. There is no family or history of diabetes, hypertension, multiple pregnancies, or congenital anomalies. She has not undergone any first-trimester ultrasound scan. 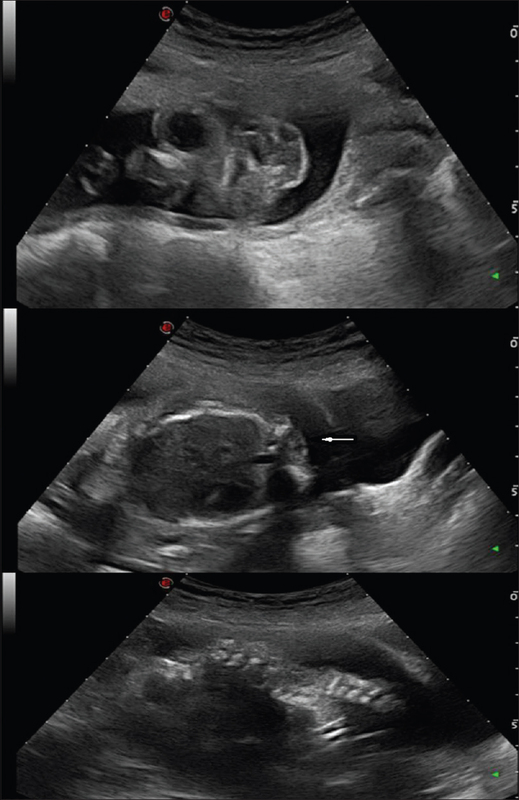 B-mode ultrasonography (USG) (Mylab50, Esoate) evaluation revealed a single live fetus in unstable lie. Fetal heart rate was 165 bpm. Placenta was anterior, and liquor was adequate. Fetal calvarium was not clearly visualized, the brain tissue appeared deformed, and the orbits were prominent. The fetal spine showed the absence of vertebral posterior elements with splaying of the lamina at all levels and exposing the spinal cord to amniotic cavity. Sagittal and coronal views of the spine showed loss of the normal thoracic kyphotic curvature. These findings were consistent with craniospinal rachischisis totalis [Figure 1]. The fetus was further evaluated by MRI performed on the same day. Fetal MRI (1.5 Tesla Avanto, Siemens) revealed the absence of calvarium with deformed brain tissue directly exposed to amniotic cavity suggestive of exencephaly. Orbits were relatively prominent compared to the small cranium. The spine also showed open spinal dysraphism with the absence of posterior elements and splaying of the spinal laminae at all levels, leading to exposure of spinal cord to the amniotic cavity noted, suggestive of rachischisis. These findings confirmed a diagnosis of craniospinal rachischisis totalis [Figure 2]. The prognosis was explained to the patient, and she opted to undergo medical termination of pregnancy. She delivered a fetus with exencephaly and spinal rachischisis confirming the in utero imaging findings [Figure 3]. A 23-year-old consanguineously married woman with 5 months amenorrhea was referred for routine obstetric USG. Her first child was healthy female baby of 3 years of age. 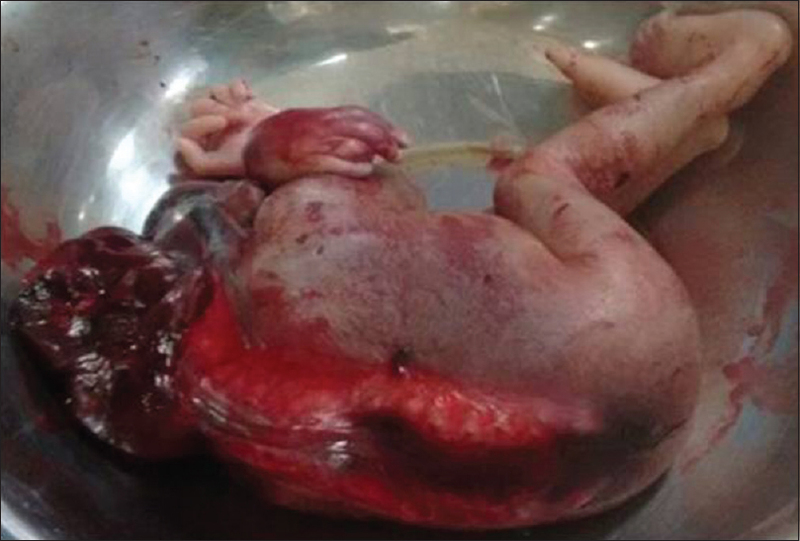 Antenatal USG revealed a single live fetus in cephalic presentation at 22 weeks of gestation. Important findings include severe polyhydramnios, bulging eyes, protruded tongue, absent cranial vault, contiguous bony defect of the spine and overlying soft tissue/skin, exposure of neural tissue. On the basis of the grayscale findings, a diagnosis of craniorachischisis totalis was made. 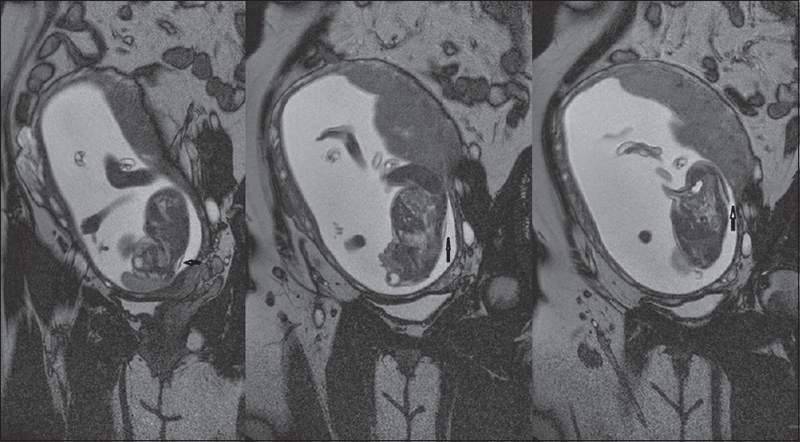 The patient was then subjected for fetal MRI (1.5 Tesla Philips Achieva). MRI showed incomplete skull and brain development with prominent orbits. Spine showed open canal and exposed neural tissue to the amniotic fluid, confirming the diagnosis of craniospinal rachischisis totalis [Figure 4] and [Figure 5]. The mother was counseled about the findings and she opted for termination of pregnancy. After induction, the fetus was delivered vaginally and died within minutes of delivery. USG and fetal MRI findings were confirmed postnatally. NTDs are common, congenital malformations resulting from complete or partial failure of the neural tube to close in the developing embryo, preventing muscle and bone from growing around the gap. Clinically, neural tube disorders are classified into open and closed types. Among these, closed NTDs affect mainly the spinal cord without significant cranial involvement. However, open NTDs often have cranial involvement. Depending on the location and severity, open NTDs can be classified as myelomeningocele, myeloschisis, or rachischisis. Most severe of these conditions is rachischisis which is incompatible with life. A PubMed search for rachischisis totalis revealed only four such reports.,,, A thorough search of literature for similar cases in “PubMed” did not reveal any reported case of craniorachischisis with both USG and confirmatory fetal MRI evaluation. USG is the standard modality of choice to rule out congenital anomalies during pregnancy. 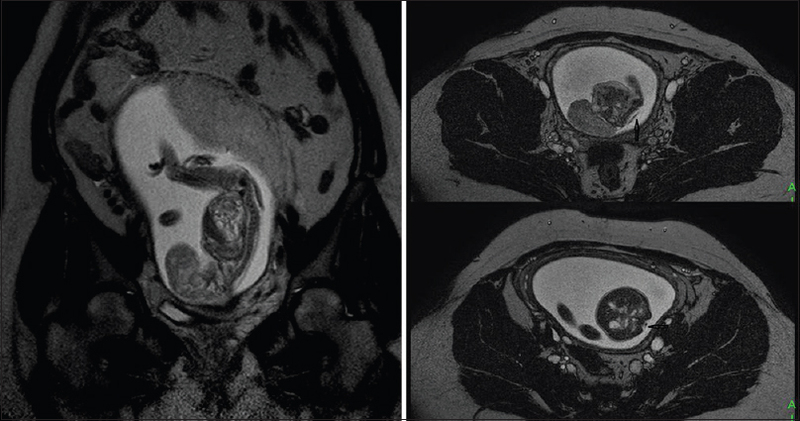 After the advent of MRI, its use was being considered to confirm the USG abnormalities.,, Some studies have questioned this indication and demonstrated no added advantage in using MRI for detecting fetal anomalies. However, MRI possibly could have a role in parent counseling. Craniospinal rachischisis totalis being a lethal congenital malformation necessitates early termination of the pregnancy. This is associated with significant morbidity in the women of reproductive age group. In addition, there is a risk of recurrence of NTDs in the subsequent pregnancies. In India, the incidence of NTDs is considered higher than the average in rest of the world.,,, A few studies from India that have analyzed the genetic component are also related to folate pathway only.,,,,, Folate supplementation has been followed for nearly more than three decades. The proportion of NTDs that can be prevented by periconceptional folic acid has not been established, but the general assumption is that it is probably in the area of 50%–60%. However, even the recommendation of periconceptional folate supplementation in women of child-bearing age in vogue for the past three decades, there was no apparent effect on the number of pregnancies with NTDs, possibly due to poor compliance apart from the unplanned pregnancies.,, To overcome this, folate fortification has been made mandatory in many countries and is being used in India also in a limited way. There is perceptible decrease in the incidence of NTDs all over the world in recent years partly due to folate fortification programs.,,, However, in India, this may have to be done with caution due to associated Vitamin B12 deficiency getting aggravated after the correction of folate deficiency.,, In this regard, the role of naturally-occurring folate may be considered as an option if it is widely used in the food mainly in our country. This study showed high content of folate in coriander, a widely used green in Indian food, and it needs further exploration. van der Knaap MS, Valk J. Classification of congenital abnormalities of the CNS. AJNR Am J Neuroradiol 1988;9:315-26. Padmanabhan R. Etiology, pathogenesis and prevention of neural tube defects. Congenit Anom (Kyoto) 2006;46:55-67. Hadzagic-Catibusic F, Maksic H, Uzicanin S, Heljic S, Zubcevic S, Merhemic Z, et al. Congenital malformations of the central nervous system: clinical approach. Bosn J Basic Med Sci 2008;8:356-60. Goldstein RB, Filly RA. Prenatal diagnosis of anencephaly: spectrum of sonographic appearances and distinction from the amniotic band syndrome. AJR Am J Roentgenol 1988;151:547-50. Oi S, Matsumoto S, Katayama K, Mochizuki M. New clinical phase in intrauterine diagnosis and therapeutic modalities of CNS anomalies. No Shinkei Geka 1989;17:1029-35. Levine D, Barnes PD, Madsen JR, Abbott J, Wong GP, Hulka C, et al. Fetal CNS anomalies revealed on ultrafast MR imaging. AJR Am J Roentgenol 1999;172:813-8. Chao TT, Dashe JS, Adams RC, Keefover-Hicks A, McIntire DD, Twickler DM. Fetal spine findings on MRI and associated outcomes in children with open neural tube defects. AJR Am J Roentgenol 2011;197:W956-61. Pitkin RM. Folate and neural tube defects. Am J Clin Nutr 2007;85:285S-8S. Van der Zwan A. Anencephaly and rachischisis; case description, pathology and aetiology. Folia Psychiatr Neurol Neurochir Neerl 1951;54:147-56. Azcoaga JE, Leicach M. Comments on an anencephalic fetus with total rachischisis. Prensa Med Argent 1955;42:2465-8. Keveshch LE. A case of so-called rachischisis totalis. Vestn Rentgenol Radiol 1958;33:108-10. Meadows JT Jr., Hayes D Jr. Rachischisis totalis without acrania in a newborn male. Pediatr Neurol 2014;51:123-5. Wald M, Lawrenz K, Deutinger J, Weninger M. Verification of anomalies of the central nervous system detected by prenatal ultrasound. Ultraschall Med 2004;25:214-7. Blaicher W, Bernaschek G, Deutinger J, Messerschmidt A, Schindler E, Prayer D. Fetal and early postnatal magnetic resonance imaging – Is there a difference? J Perinat Med 2004;32:53-7. Pistorius LR, Hellmann PM, Visser GH, Malinger G, Prayer D. Fetal neuroimaging: ultrasound, MRI, or both? Obstet Gynecol Surv 2008;63:733-45. Peruzzi P, Corbitt RJ, Raffel C. Magnetic resonance imaging versus ultrasonography for the in utero evaluation of central nervous system anomalies. J Neurosurg Pediatr 2010;6:340-5. Messing-Jünger AM, Röhrig A, Stressig R, Schaper J, Turowski B, Blondin D. Fetal MRI of the central nervous system: clinical relevance. Childs Nerv Syst 2009;25:165-71. Verma IC. High frequency of neural-tube defects in North India. Lancet 1978;1:879-80. Kulkarni ML, Mathew MA, Ramachandran B. High incidence of neural-tube defects in South India. Lancet 1987;1:1260. Gupta H, Gupta P. Neural tube defects and folic acid. Indian Pediatr 2004;41:577-86. Allagh KP, Shamanna BR, Murthy GV, Ness AR, Doyle P, Neogi SB, et al. Birth prevalence of neural tube defects and orofacial clefts in India: a systematic review and meta-analysis. PLoS One 2015;10:e0118961. Godbole K, Deshmukh U, Yajnik C. Nutrigenetic determinants of neural tube defects in India. Indian Pediatr 2009;46:467-75. Harisha PN, Devi BI, Christopher R, Kruthika-Vinod TP. Impact of 5, 10-methylenetetrahydrofolate reductase gene polymorphism on neural tube defects. J Neurosurg Pediatr 2010;6:364-7. Naushad SM, Devi AR. Role of parental folate pathway single nucleotide polymorphisms in altering the susceptibility to neural tube defects in South India. J Perinat Med 2010;38:63-9. Godbole K, Gayathri P, Ghule S, Sasirekha BV, Kanitkar-Damle A, Memane N, et al. Maternal one-carbon metabolism, MTHFR and TCN2 genotypes and neural tube defects in India. Birth Defects Res A Clin Mol Teratol 2011;91:848-56. Saxena AK, Gupta J, Pandey S, Gangopadhaya AN, Pandey LK. Prevalence of cystathionine beta synthase gene mutation 852Ins68 as a possible risk for neural tube defects in eastern India. Genet Mol Res 2011;10:2424-9. Arora J, Saraswathy KN, Deb R. Effect of maternal Tp53 gene G412C polymorphism on neural tube defects: A study from North India. Indian J Hum Genet 2012;18:177-82. Shaw GM, Schaffer D, Velie EM, Morland K, Harris JA. Periconceptional vitamin use, dietary folate, and the occurrence of neural tube defects. Epidemiology 1995;6:219-26. Olney RS, Mulinare J. Trends in neural tube defect prevalence, folic acid fortification, and vitamin supplement use. Semin Perinatol 2002;26:277-85. Bell KN, Oakley GP Jr. Update on prevention of folic acid-preventable spina bifida and anencephaly. Birth Defects Res A Clin Mol Teratol 2009;85:102-7. Cuskelly GJ, McNulty H, Scott JM. Fortification with low amounts of folic acid makes a significant difference in folate status in young women: implications for the prevention of neural tube defects. Am J Clin Nutr 1999;70:234-9. Mills JL. Fortification of foods with folic acid – How much is enough? N Engl J Med 2000;342:1442-5. Centers for Disease Control and Prevention (CDC). Trends in wheat-flour fortification with folic acid and iron – worldwide, 2004 and 2007. MMWR Morb Mortal Wkly Rep 2008;57:8-10. Safdar OY, Al-Dabbagh AA, Abuelieneen WA, Kari JA. Decline in the incidence of neural tube defects after the national fortification of flour (1997-2005). Saudi Med J 2007;28:1227-9. Smith AD. Folic acid fortification: the good, the bad, and the puzzle of Vitamin B-12. Am J Clin Nutr 2007;85:3-5. Liu P, Bhatia R, Pachón H, Emory. Food fortification in India: A literature review. Indian J Community Health 2014;26 Suppl S1:59-74. Smith AD, Kim YI, Refsum H. Is folic acid good for everyone? Am J Clin Nutr 2008;87:517-33. Puthusseri B, Divya P, Lokesh V, Neelwarne B. Enhancement of folate content and its stability using food grade elicitors in coriander (Coriandrum sativum L.). Plant Foods Hum Nutr 2012;67:162-70.